Branch out into colorful rosé territory with a match of salmon and grilled veggies. The belief that fish can only pair with white wines is not always the case. The main factor to consider is how tannic (or how heavy and mouth-drying) your red wine is, as well as the weight and texture of the fish. There are many fish in the sea, and thus, all fish were not created equal. 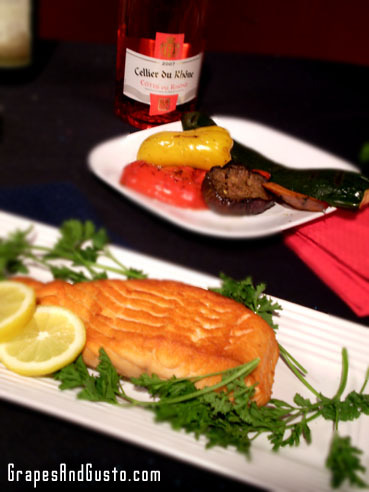 Lucky for us, salmon is a hearty fish, both in flavor and texture, and can withstand some heftier wines within the “light” category. A classic pairing of salmon is, in fact, Pinot Noir – the finicky, lighter-bodied red wine made famous in the movie Sideways. Somewhere in between sippy-sip white wine land and big-bad-Barolo land lies rosé wine. Yes, it’s the pink wine – though to be fair, rosés can range in hue from the faintest blush to a deep, peach-like salmon color (pun intended). Rosés can be made from various grape varietals and the winemaking style contributes much to the final sweetness level of the wine. Unlike the well-known “sweet pink wine” that is white zinfandel (nothing wrong with it, but it spawned a widespread misconception that all pink wines are sweet), only a fraction of rosé wines are actually downright sweet. Go ahead and give the drier varieties, especially from Bandol, Provence and Rhône, a try with your next meal of grilled salmon. The fruitiness in the rosé will not be cloying, but will provide a lift to each substantial morsel of salmon. This will work nicely with herbs grilled with the salmon, as well. Rosés are versatile enough to also accompany that beautiful platter of grilled or roasted vegetables you’ve laid out on a pretty platter. Pairing rosé with colorful foods results in quite a feast for the eyes as well as the palate, and is yet another fun way to branch out over the summer. This post is part of a series about summer food and wine. See the first post in this series. Good examples: Try French Rosés from Bandol, Tavel, Gigondas or Cotes de Provence (i.e., Chateau du Rouet, Cotes de Provence; $15), or Francis Coppola, Sofia Rosé 2008 (California, $18). Value pick: La Ferme Julien Cotes du Ventoux Rosé 2007 (France, $5).